Re-locating from a small town of 1,700 people in 1992, Dr. Malisos moved to Kansas City and attended the University of Missouri – Kansas City School of Medicine. He preferred the intense six-year combined Bachelor of Arts and Doctor of Medicine degree program instead of the longer eight-year traditional route. After he graduated in 1998, he attended the family practice residency program at Trinity Lutheran Hospital. Dr. Malisos had the opportunity to take month-long rotations with multiple Board-Certified specialists including those in the fields of Cardiology, Dermatology, Gastroenterology, Geriatrics, Infectious Disease, Nephrology, Obstetrics/Gynecology, Oncology, Ophthalmology, Otolaryngology, Pediatrics, Podiatry, Pulmonology, and others. 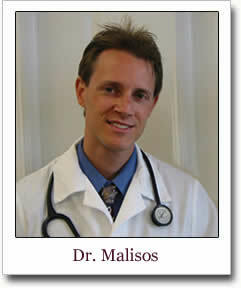 One of the passions Dr. Malisos has is helping patients achieve Optimal Weight and Optimal Health. As an avid exercise enthusiast and believer in superior nutrition, Dr. Malisos leads by example when it comes to maintaining a healthy lifestyle. Many people have trouble controlling their weight and Dr. Malisos successfully manages them using a holistic approach to ensure long-term persistent results. Lifestyle changes, meal optimization, exercise augmentation, and medical management are some of the strategies used to help patients lose weight. No one has ever not successfully lost their weight (and kept it off) if they followed Dr. Malisos’ treatment protocol. While Dr. Malisos is the first to admit that his protocol may, at times, be intense, the rewards are worth it. If you are in the Kansas City area and need a health coach that won’t give up on you, Dr. Malisos is the professional to see. Dr. Malisos is extremely proficient in Dermatology and had the pleasure of working with some of Kansas City’s best Dermatologists. When he came to Liberty, he was surprised at the large number of skin cancers that area residents have. He excises malignant melanomas, basal cell cancers, squamous cell cancers and others on a daily basis in his office. In addition, he freezes off warts, skin tags, seborrheic dermatoses, actinic keratoses (pre-cancers) and many others. Believing in the comprehensive health of the entire family, Dr. Malisos keeps up-to-date with the most current advances in medicine striving to continuously improve his medical knowledge and the care of his patients. He regularly works on Continuing Medical Education activities and periodically attends CME seminars across the country and around the world. Dr. Malisos believes in treating the underlying medical problems patients have – not just giving them a medication to treat the symptoms. While trained in traditional allopathic Western medicine, Dr. Malisos embraces natural holistic medicine as well. Many medical conditions can be treated without the need for medications and Dr. Malisos will give you options to treat your condition that you are comfortable with. Dr. Malisos has frequently worked 12-hour shifts in the Emergency Room. By treating critically ill patients (those who are coding, having strokes, heart attacks, etc.) and using Advanced Cardiac Life Support, CardioPulmonary Resuscitation and Pediatric Advanced Life Support, Dr. Malisos has additional medical experience and is confident in treating people for nearly all their medical problems without generally having to refer patients to specialists. Dr. Malisos exercises most days of the week, runs 7 miles over his lunch hour, is an Iron Man Triathlete, and practices gymnastics most days of the week. His hobbies include going on dates with his wife, having fun with his kids, and reading.